My thoughts are still tangled up in winter though, an evening out last week with my friend Yvonne to visit with her family (about 45 minutes outside of Vancouver) brought back an iconic Canadian memory to mind – we drove past a small group of young men and boys playing hockey in the cold air on a small frozen pond, something I experienced while living in the province of New Brunswick, my brother and I discovering a naturally frozen expanse among a stand of trees just across the street from where we lived. I remember the sound of sharpened skate blades tracing patterns on the frozen surface, the frosty air colouring our cheeks rosy red and the thrill of being on our very own secret skating rink, hockey sticks in hand. Winter images that remind me of glitter dusted Christmas cards lovingly collected. 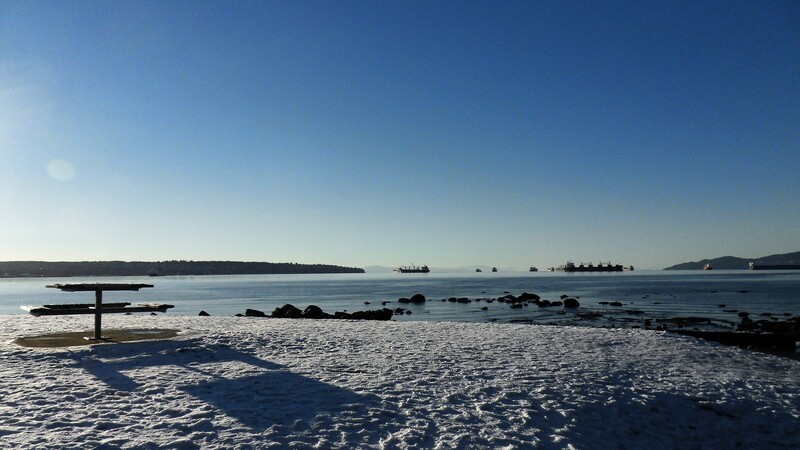 A perfect spot for some winter thoughts at Second Beach (Vancouver, B.C.). 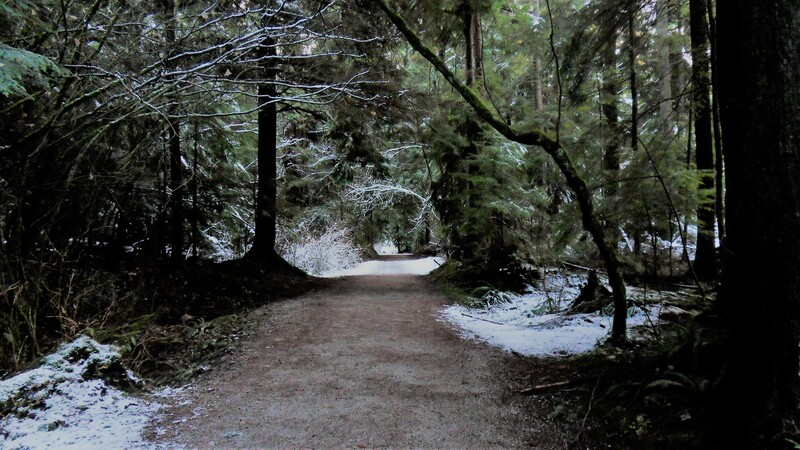 Snow dusted trees and trail in Stanley Park (Vancouver, B.C.). 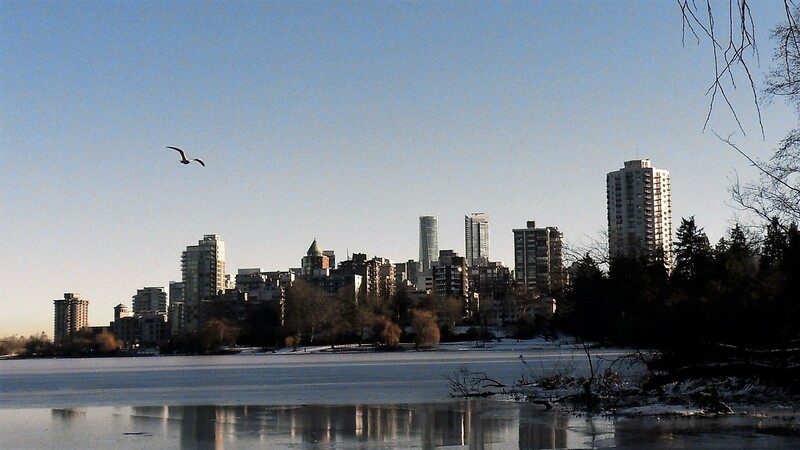 A view of an icy Lost Lagoon and the Vancouver skyline. 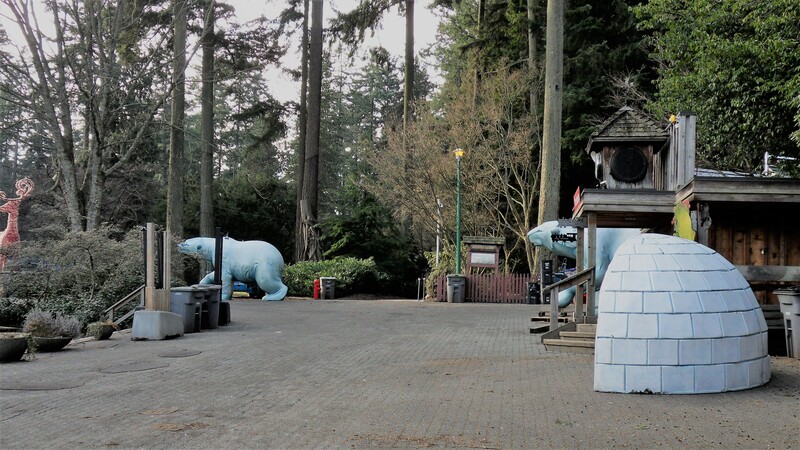 Another shot of the adorable polar bears returning home from their “Bright Nights” gig in Stanley Park (Vancouver, B.C.). In memory of Matt S.
This entry was posted in blog, journaling, life, memoir and tagged anxiety, Canada, change, dark sky, hockey, life, nature, New Year, questions, rain, skating, solitude, storm, Vancouver, wanders, winter. Bookmark the permalink. You writing always hold such beautiful and deep thoughts, and this question “Who am I here to be?” will always urge the heart to seek. Maybe the reflective and silent reminiscing will reveal the answers. I feel so blessed to be able to seek out the sacred spaces that call me, they often give me respite as well as answers! Thank you for your very kind and always lovely comments. For light to poke through, there must be the darkness. And with the darkness comes the pain, breath held, we look for the sun, the shining on the waters, the liquidity oozing from the bark of the trees, the orchestration of the drip, drip, of the leaves. The scream of the birds, unsettled, cold the cadence, and suddenly , somewhere comes relief. For some we feel the darkness, for others they have reached the warmth of the sun.. Very touching words from you and your mom. My heart is with Yvonne , her companion and his great loss. After the immense pain, a bouquet of sun rays from the sky will bring the best memories alive. Rip Matt🌟.🙏🏼😢🙏🏼😢🙏🏼🌟 thank you Kim for your profound caring. Your words and my Mom’s are so comforting…I like to think that Matt has finally reached the sun. I hope to experience winters like the “glitter dusted Christmas cards” someday. Oh for a frozen pond! I am feeling very anxious about the new year too. Perhaps you are right that the wisest move is to put away our own resolutions and open our minds to whatever the world calls us to be. I’ll be thinking about that. Thank you for this and for sharing your thoughts about the new year 2.0, I believe if we can look at things differently, we may be able to empower ourselves and weather any storms that come our way! Your post spoke to my heart. Such beautiful words, they’ve warmed my heart. Such a thoughtful post, Kim! This one has many memories and emotions attached. Wishing you all strength that your eyes do not loose sight of the light on the darkest night! Your words are like embers, I will keep them close to my heart! Thank you (always!) for such lovely comments. A beautiful post. I love Khalil Gibran. Your words warm my heart, I’m so glad you enjoyed this piece! No problem and thank you for stopping by! Here’s wishing you a lovely week as well, you inspired me to go out and chase the sunset last evening after I read your post about your beautiful walk! I am “truly” touched by your beautiful comments! You take absolutely stunning photos. I’ve never been to Vancouver but really hope to go eventually! For now, I’ll see it through your eyes! Thank you so much! I’m glad you stopped by and hope to see a post on Vancouver on your lovely blog soon! Thank you so much for stopping by & commenting, your words continue a beautiful thread! Thank you for your very lovely comment! I’m glad you enjoyed this read and the quote!! I love the quote you put at the beginning of the post – it’s beautifully prosaic. And I definitely agree that nature is perhaps the world’s greatest works of art 🙂 I also like those wintry photos, especially as someone who’s only seen snow once in her life. Thank you so much for stopping by & commenting, your words brightened a very rainy morning! I’m so glad you enjoyed the read!